As many of you know, I've thought long and hard about changing Olive Weddings into a new, more modern and classy blog. I really wanted to change the name (see my posts about this here and here), because I was tired of the name. To be perfectly honest, I thought the name was kind of dumb. It's not as clever as the names of a lot of really cool wedding blogs out there -- blogs I admire and wish I could be called among. My plan was to change the format and even some of the content. I searched (and I mean searched) for new premade blogger templates. I bought a few headers and even contemplated getting a full blog makeover. I came up with the new name, "From Madness to Marriage: the musings of a girl gone bridal," and planned to pay for a custom illustration and revamp. I was even going to change my dot com! There I was, ready and set to launch into a new world of blogging. A more beautiful and glamorous world. One that might come with it recognition and envy. I was ready to have a new look, the perfect name, and volia the fulfillment would settle in, but as much as I racked my brain for new ideas and searched for new templates, I couldn't come up with anything I felt I could stick with. I mean, I like the madness to matrimony idea, but what's wrong with keeping things they way they are? There's nothing wrong with Olive Weddings and I was starting to miss my old template. I loved this blog when I first created it. I've made a lot of these changes and I tried a few new approaches. All of it, just to find that I wanted back what I started with. Nothing has looked as good as this original template, which I found over a year ago on an awesome site called Yummy Lolly. The best part is... it was free. Why do I want to be a big time blogger anyway? I'm so totally content with the readers that I have, there's no need to have more. I've gotten more than I ever imagined out this blog, just the way it is. You guys have no idea how awesome I feel when I get comments from you... It's so nice to know somebody is listening and watching! I think I just started to feel like I needed to be better for you guys, but nobody ever asked for that. I looked at all the amazing blogs out there and thought I needed to do something to be amazing too, when in all actuality, I'm prefect content just blogging here, the way it is, for the few of you that come by from time to time. I want to relate this topic to our wedding, because I think there are a lot of parallels. Like blogging, a lot of people get married. There's a lot of blogs out there and a lot of weddings out there. It's easy to look at the weddings on Style Me Pretty and want to have a wedding just as stunning, or read about the fabulous DIY brides on Weddingbee and want to be just like them. While it's fun to imagine these things and it's alright to strive to be better, it's not cool to think you've got to change something to meet a more mainstream standard. Of course I want a blog that is recognized and admired and of course I want a platinum wedding done up David Tuttera style, but at the end of the day I think I'm off better off sticking with what I know. My point is that through this blog and through the process of planning our wedding, I'm learning to stay true to myself. I don't have to have the same type of blog as the next bride-to-be, no matter how cute hers is. I also don't have to a clever, awh-inspiring name that is going to make my pasttime my career. The only thing I have to do is enjoy blogging. That's it. The same goes for my wedding. I don't have to have all the frills or all the expensive extras. I just have to have a good time. I've just got to remember the reason I'm there and the reason I'm here. Have you felt blog and/or wedding envy? How did you deal with it? Did you try to transform into something your not too? Share your stories, they are always welcome! i am so happy you decided to keep your name. although, i have already planned my wedding i LOVE weddings and love to see what the brides are doing now. i am new to the blog world and although i see other blogs out there that have hundreds and hundreds of followers that wasn't my goal to start blogging. i just wanted to do something. i had been online for over a year just researching wedding stuff and i needed to find something else to occupy the time i use to spend on wedding sites. to be honest, i never thought that one person was going to follow me. as for the name, it was what i knew i was going to be writing about. simple and easy. is it catchy? not at all but i don't have anything to prove. it is during blogging that i can be who i am, write what i feel and just be me. i am not going to change it to have my readers/followers be more entertained. if they aren't entertained by me, i do not think they would have followed in the first place. Oh my goodness, I was nodding the hole time I was reading this. IN blogland, we try to not to critique and just support people and decisions they make, maybe just offering a suggestion here or there and when you said you wanted change, that's what I did. However, I really saw nothing wrong with the blog you have now. So many blog templates are just plain but the content is so cool. I don't think your blog has to be over the top to be awesome. I think Olive Weddings is awesome as is. And I thin we've all had wedding envy, dress envy or some other envy during the process of wedding planning. I used to feel the same way. I felt like a loser when I 1st started with my little group of all of 4 followers. It was like that for a LONG time till I posted my blog on the WB thread. I used to be totally jealous of not only Bowie Bride's following, but her incredible b@! !$ to the wall writing style. I was amazed at the incredible DIY some women come up with. My DIYs always look like kindergarten projects. Oh & P.S. -- I can't stand D.Tutera. He ruins people's weddings and tells them that what they've always dreamed of is tacky & unacceptable. Im so glad you stayed true to you and to your blog and your blogs name! I love your blogs name and you! You have been a wonderful blogger and are a wonderful person. I try to stress the same message on both of my blogs for brides to stay true to who they are. I went through the same thing when I first found wedding blogs like Style ME Pretty and WeddingBee. But then I realized too that Im just not that girl and im not that bride! I have to be me and this wedding is going to be about us. PS It was the best day, one of the best days of our lives. It was about us, our children, and our family. But it started with us and who we are. And we did a sand ceremony that included the children. I just felt the love all day long. Glad your here and blogging with us! THANK YOU, THANK YOU, THANK YOU, everyone for your lovely comments :) They really made me feel good about my little blog! I was so glad that all of you could relate to my feelings of blog/wedding envy. I love ALL of your blogs and I'm so glad that we have each other... I honestly don't know where I would be without your support! @Dancy -- I agree that David is way overrated! I definitely don't think I could handle anyone, even him, coming in at the last minute and throwing all of my hard work out the window! 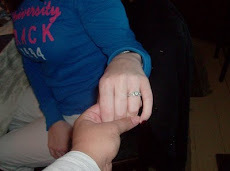 Our Engagement Party: A Huge Success!